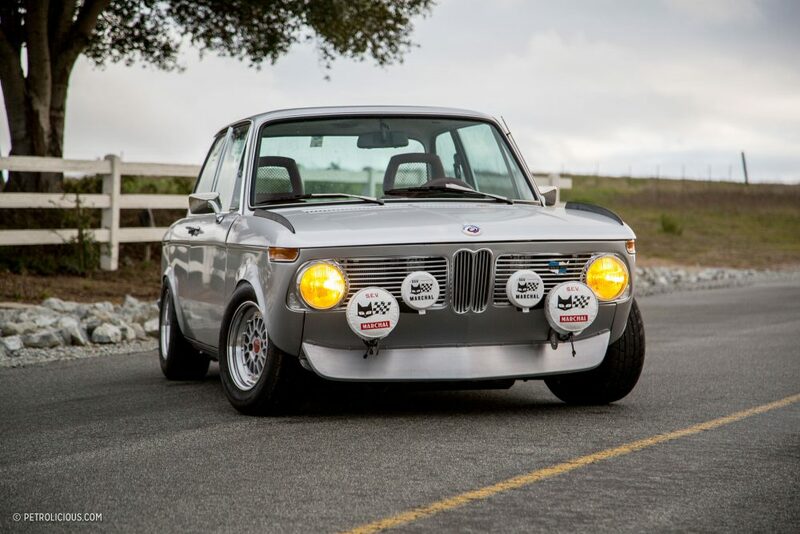 Calling this BMW 2002 is “modified” would be a huge understatement. 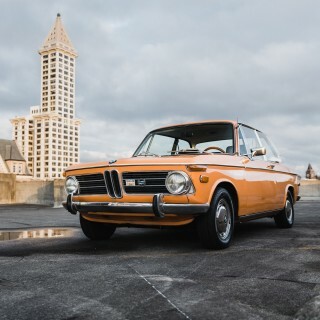 You’re looking at Ali Javidan’s 1971 BMW 2002, and it is a beautiful example of what 20 years of ownership and an engineering background can do to a tired old sports sedan. 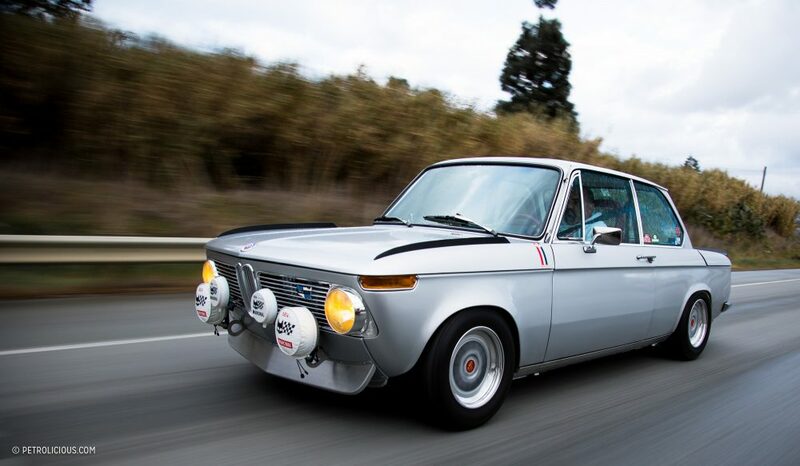 Walking around the brilliant silver BMW you will notice all the little unique touches added to this E10. Up front the prominent Marchal driving lights are paired with a Koogleworks front air dam, evoking a presence much like period endurance examples of the chassis. 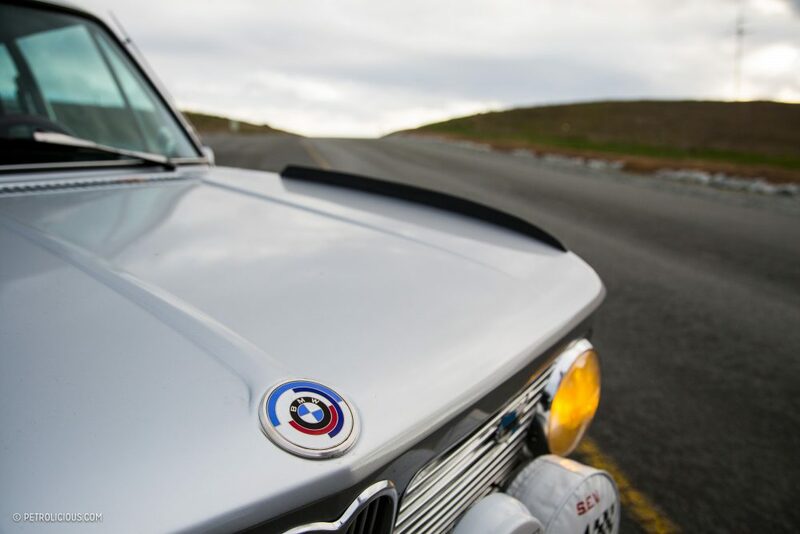 Before cracking the clamshell hood or peeking through the window you’ll see the BMW Motorsport roundel on the hood, which was made from glass and custom fitted with a machined metal housing. 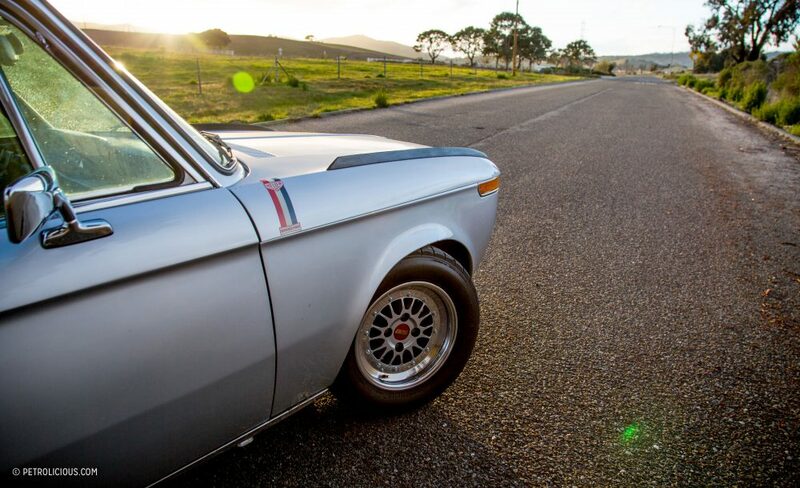 Running down the sides of the hood are long black wind splits, similar to those on the BMW 3.0 CSL. 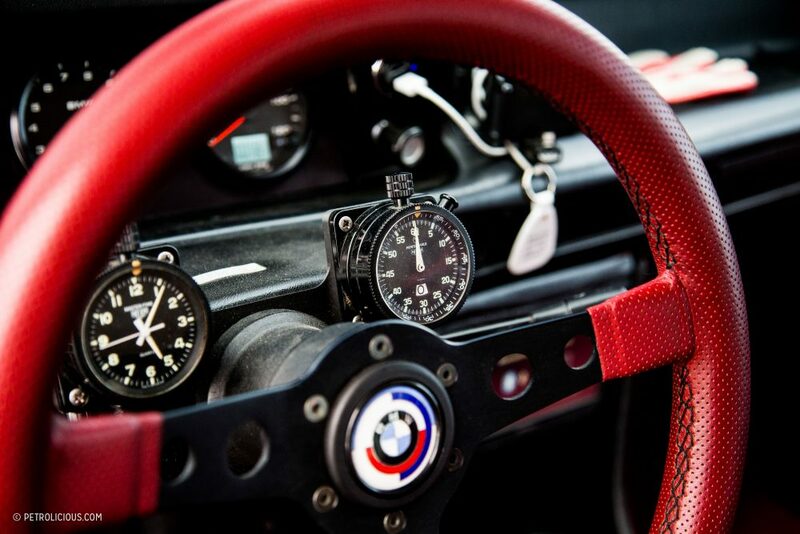 The motorsports, or Motorsport, theme is carried throughout the car and defines its character. 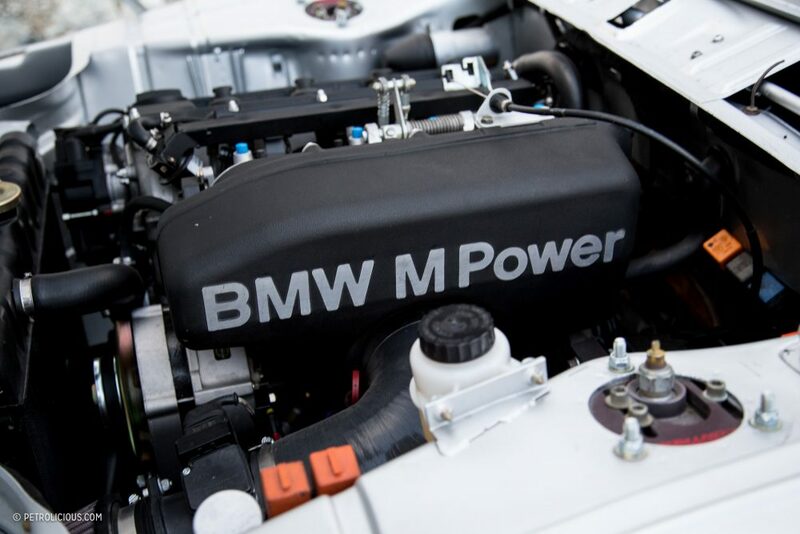 And for good reason, as BMW Motorsport is truly at the heart of this build; this ’02’s engine is none other than the homologation special from the E30 M3, the inline-four S14. 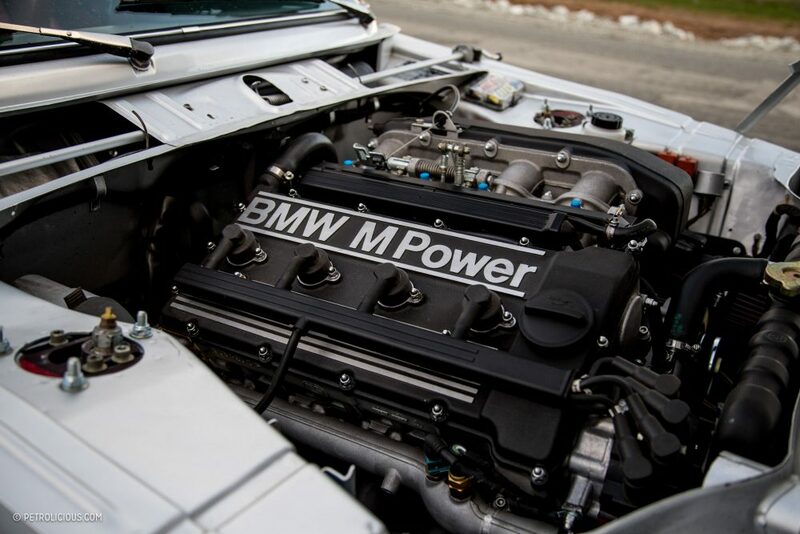 This swap has been done before, and 2002s running it are often and affectionately called M2s. Of course, just a motor swap alone would be something of note, but the level of detail that has gone into this entire build sets this car apart. An engineer by trade, Javidan is always looking for new ways to improve designs with a mechanical function. 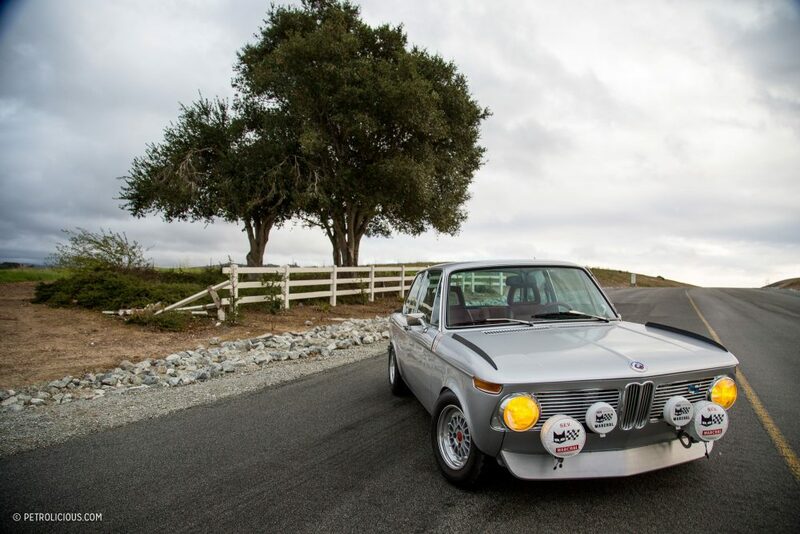 For instance, the suspension in his little silver Bimmer is a product of years of experience with companies like Ground Control and Dinan. It has been completely redesigned to work with the lowered stance, while offering compliance and superb handling characteristics at the limits. 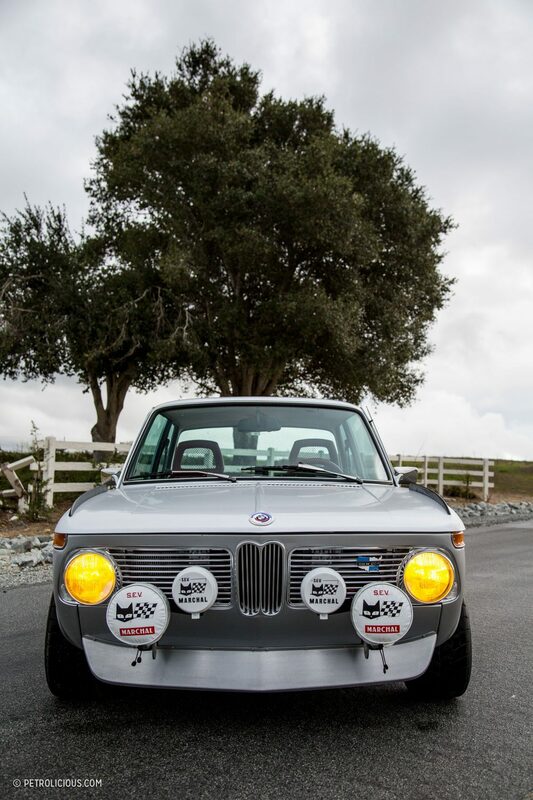 Observing the stance of the ’02 in person, it appears the BBS wheels would hit the tops of the fender with any amount of steering angle or suspension compression. 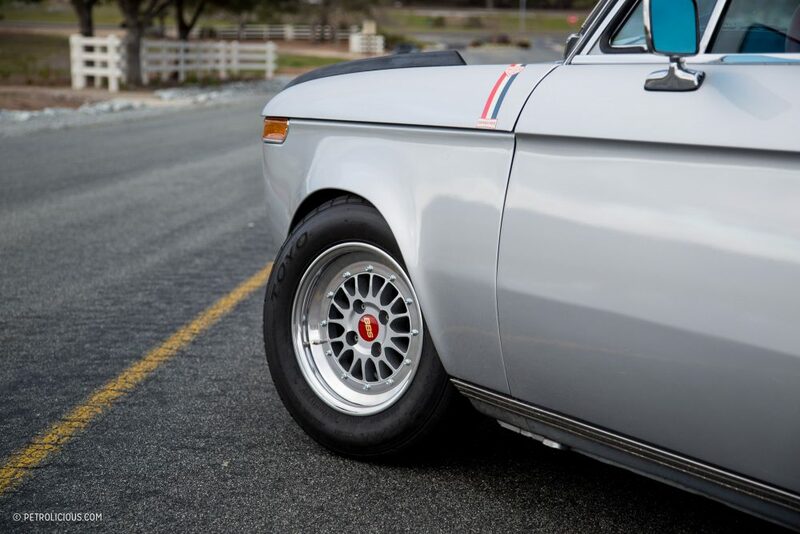 The camber is dialed in though, and the wheel’s travel goes inward just enough to clear the fender lip—no rubbing and burned paint here. 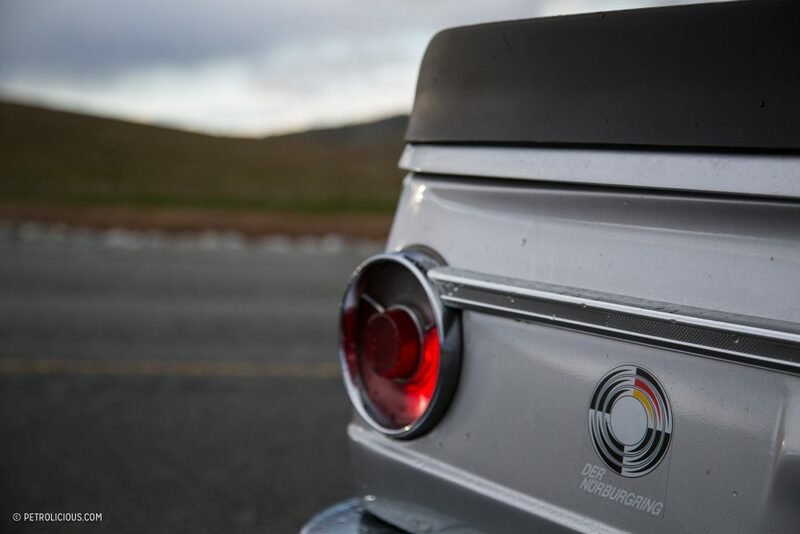 To find out how the car got to this point, I sat down with Javidan to talk about its history from the beginning. 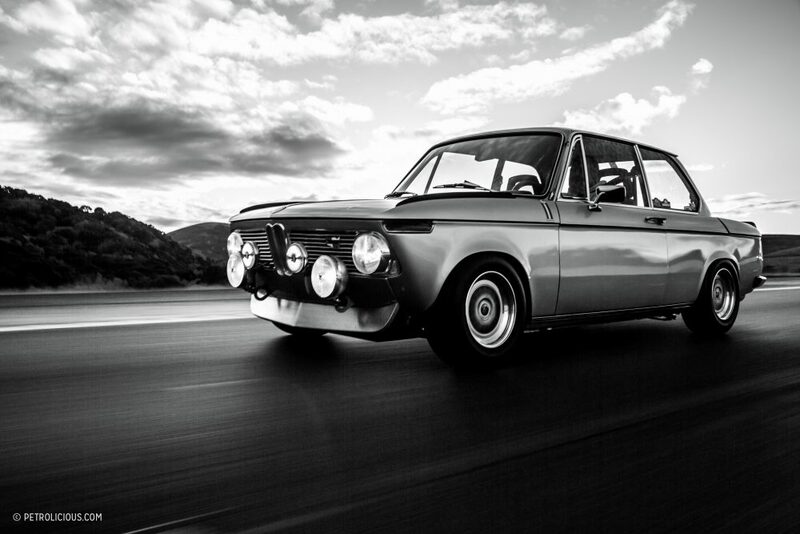 Patrick Stevenson: How did you end up buying your BMW 2002? Ali Javidan: I knew about 2002s ever since I can remember. 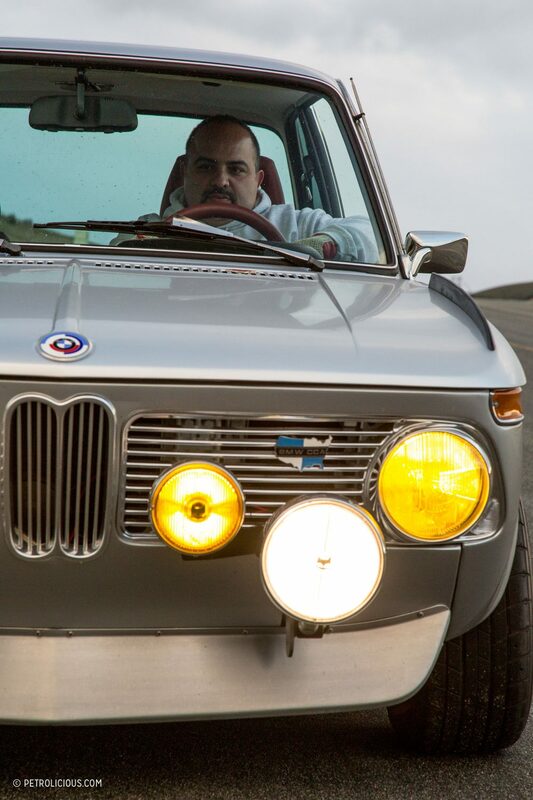 My uncles all had them back in Iran in the ’70s and ‘80s, and they used to talk about how fun they were to drive. I was always into cars, and the engineering that went into the design and build of them especially so. 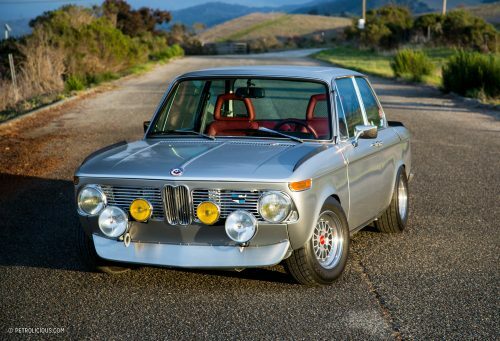 This was my first BMW. I needed a cheap, fun, reliable car to commute in for college at the time, and I had been looking at everything from small pickup trucks to Honda Accords. 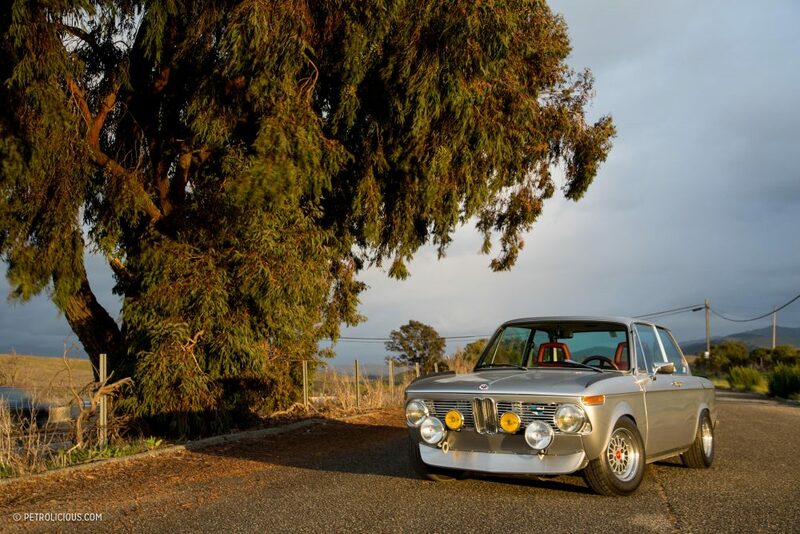 My cousin’s neighbor had this old BMW that they drove on occasion and I would talk to them about it off and on, never thinking about purchasing it though. They found out that I was looking for a car at some point, and they offered it to me for $800.00. 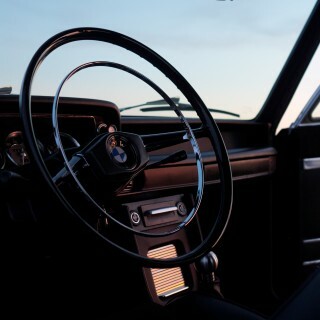 I was not thinking about the BMW—I wanted something a bit more modern—but I figured that it did not need smog testing, it had a great reputation as a fun driver’s car, and it was cheap. So, I took it for a drive around the neighborhood and fell in love with it! 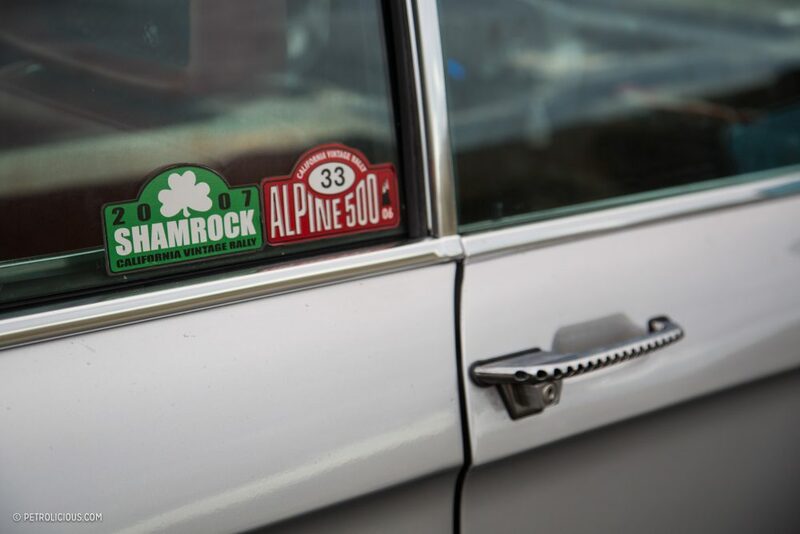 It was bone stock back then, and they were the original owners. I offered them all the cash I had, which was $550.00, and they accepted. This was in 1997. PS: You’re just the second owner then, so how long before you started modifying it from the stock setup you received it in? 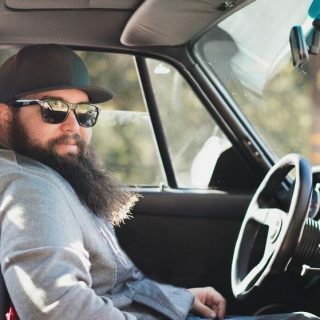 AJ: I joined the BMW CCA as soon as I got the car and immersed myself in the BMW community in Sacramento. I drove the car as it was for a while, but after about a year I started to do some modifications, mainly with the aim to autocross it. 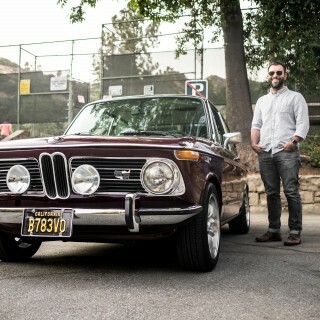 That is when I met up with Steve Kupper and the BMW2002faq.com community as well. I was enjoying the car thoroughly, that is until the engine blew up on a drive home from school one evening. PS: Oh man, that is terrible. What made you decide to rebuild it? AJ: About six months after I bought the motorcycle I got into a pretty major accident and broke a lot of bones in my arm and leg, so I had to take a six-month break from school and work to recover. During this time with practically one arm and one leg and some help from friends, I took the 2002 apart and began to rebuild the engine. It took me about three months to do the engine and refurbish the suspension and get my car running again. I built the car to compete in autocross and did well for a while. PS: Yes, I noticed the suspension is far from stock. How did this particular setup come to be? AJ: In the year 2002, I joined Ground Control as a student engineer working on racing programs and component design. During this time, I would spend my extra pennies designing and building parts for my personal car, so some of the special parts that are on my car won’t be found anywhere else. I designed all the chromoly tubular control arms and the heim joint suspension, as well as a re-engineering of the whole suspension geometry on the car. Also during this time, I wanted to paint it and fit wider wheels and tires, so I began to teach myself body work. I had some guidance from friends, but I did all the flare work, welding the trim holes, and body surfacing myself. 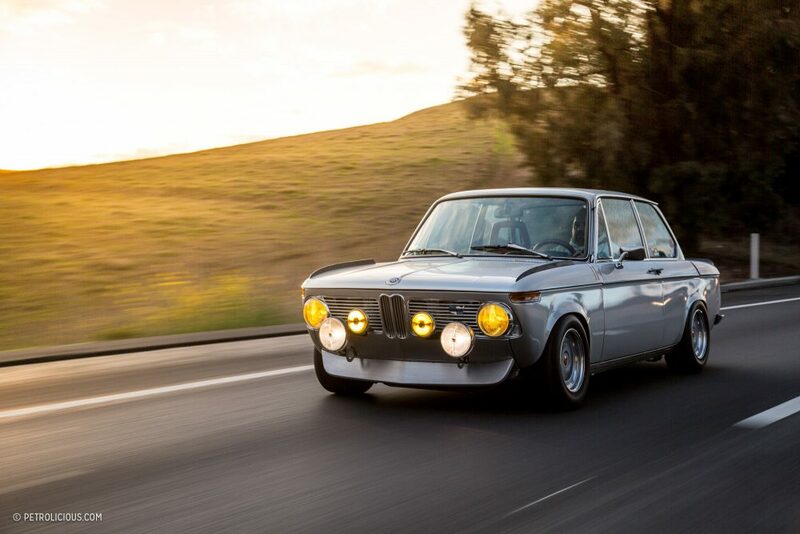 PS: Well it looks amazing, and the subtle differences make it stand out from all the other modified ’02s out there. What is the story on the color? 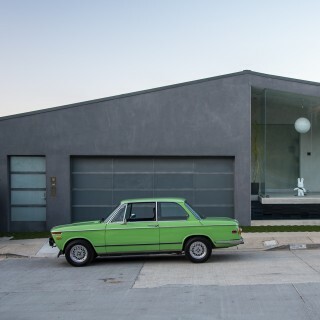 Is that a factory BMW silver? AJ: Well, after graduation my commute time went up dramatically and I needed a reliable comfortable car, one with A/C, so I finally bought that Honda Accord and the 2002 was sidelined for a bit while I focused on my career. The car ended up in a brief hibernation. By 2013 I had collected enough money and parts to begin the full restoration. I sent the car to my good friend, Stuart Krum, who owns Schatz & Krum in Sacramento, for him to start on the paint and body work. BMW has a few differently shades of silver, and I wanted to stick with a OEM color. The E46 M3 came in a color called Titanium Silver and I absolutely fell in love with it. 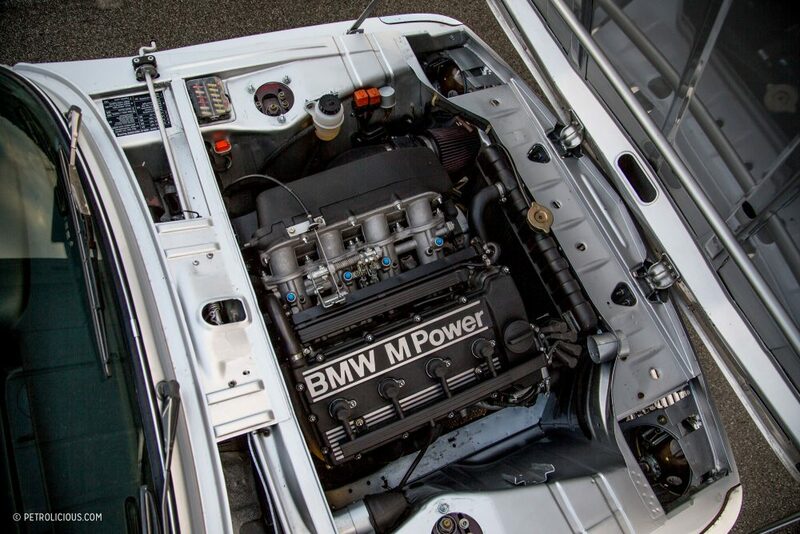 PS: And at what point did you add the E30 M3 motor, the S14? AJ: An S14 had always been my dream motor for the car. I had purchased one that Stuart was going to rebuild for me and install, and so Stuart had the car until about 2015 and the progress on the work was very, very slow. So once he had the car painted I went and picked it up. Then I sent the S14 to Terry Tinney for a full build, and I started on all the chassis and detail work in my garage. I have to give a special thanks to Terry for doing such an amazing job on my engine! 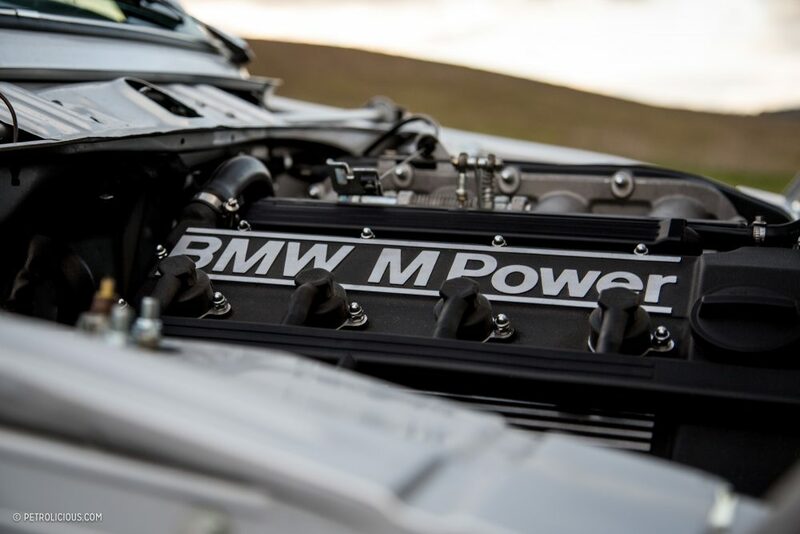 PS: Aside from the M3 power plant, what else did you do during the restoration? AJ: I stripped the chassis components off of the car and began the final stage of re-engineering everything. I added adjustments on the rear suspension, raised the rear subframe for better geometry, refined my front suspension a bit, completed a wholly new braking system, integrated electric power steering to help turn the wide tires on the factory motorsport close-ratio steering box, etc… I spent a lot of time on things like body prep, cooling, and lighting, too. In early 2016 I got the car back together with the engine in it and put it on the ground. 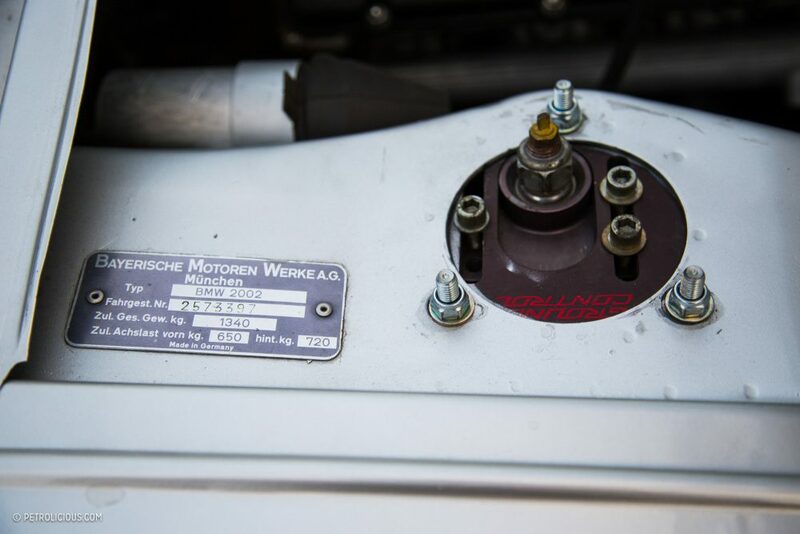 There were still a million little things to do like wiring and trim, and I ran out of time and patience to do this work, (I now had two kids), so I reached out to the guys at Edge Motorworks in Mountain View, who were amazing! They rewired the entire engine bay, and got the engine running and made the bay look like a showcase! They also took care of all the seals, attachments, sunroof rebuild, etc…I have worked with them a lot with the M3 that I have, and even back at Dinan, and they are consistently the best BMW shop in northern California. 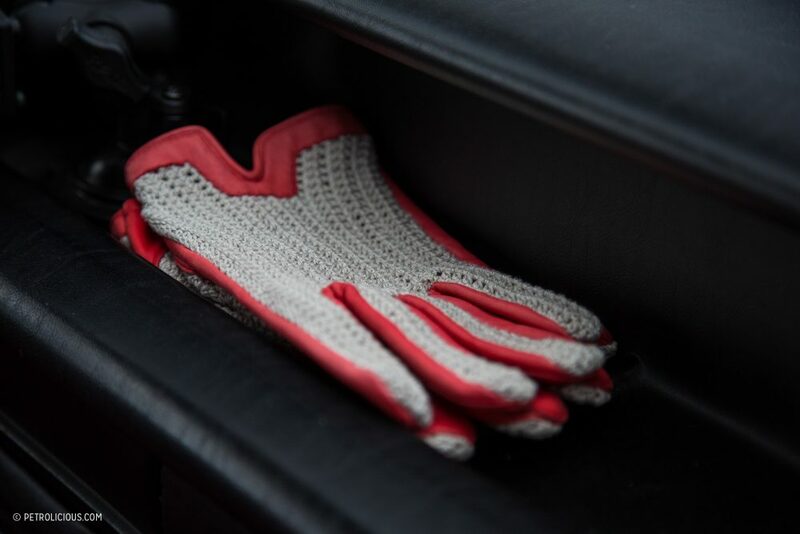 My car would definitely not be as nice as it is without them. PS: It sounds like you went in deep to transform this car. 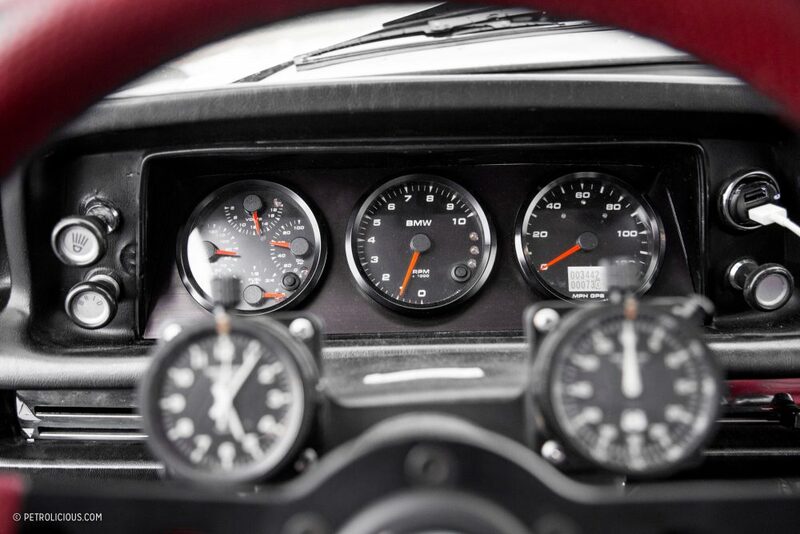 Can you tell me about the interior choices, as they seems to match the extremes of the drivetrain and exterior. AJ: Sure. 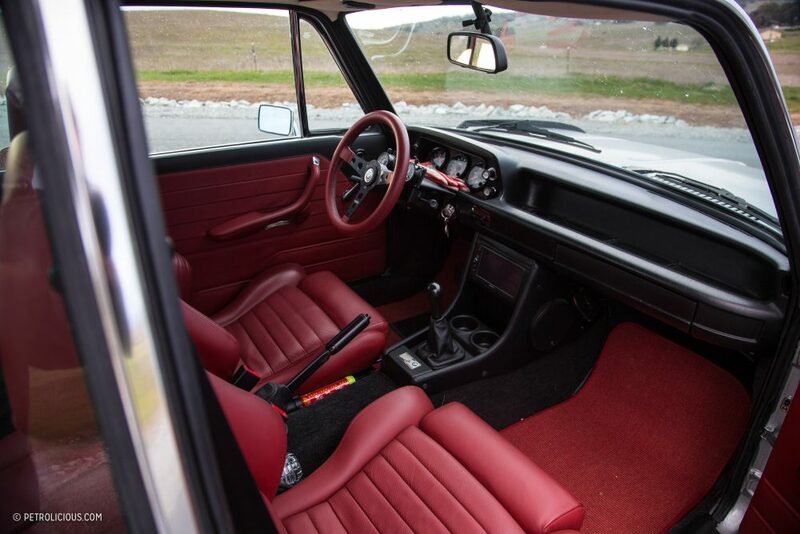 I wanted the interior to pop, but to be very classic and retain some period styling. So, I sent it to Sid’s Custom Upholstery in Mountain View. 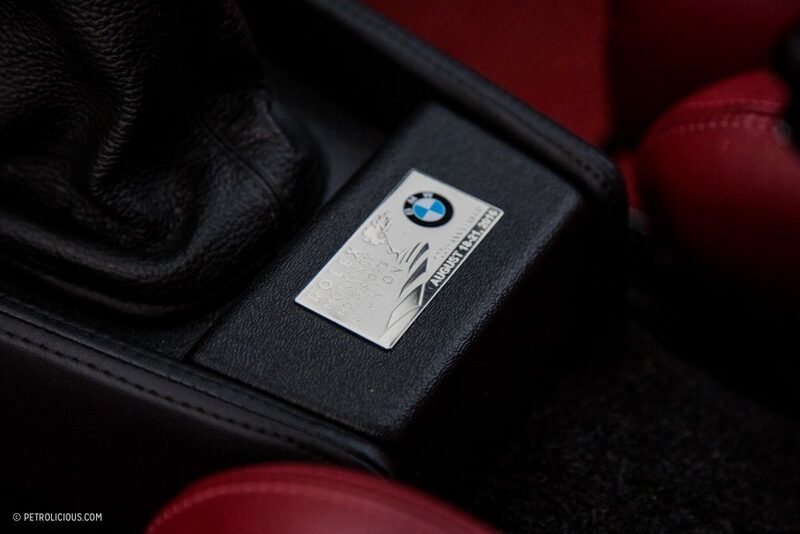 I chose Imola Red leather from the E46 M3 options, and Sid’s was able to get the material while I spent a lot of time designing the details of the interior to get the lines right and the materials to work together. 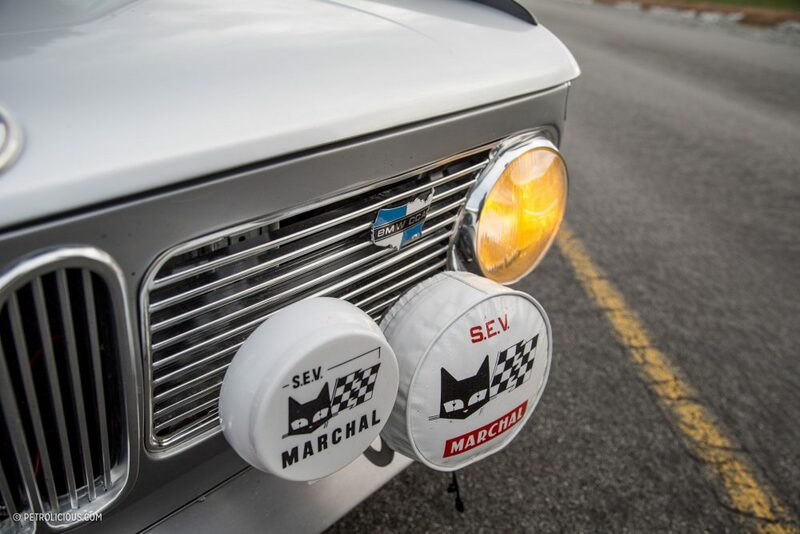 The car was finally on the road in September of 2016, and I have been adding a few touches here and there like a bunch of goodies from Forrest at Kooglewerks and some cool rally lights, BBS magnesium wheels, vintage Heuer rally timers, and more items. PS: It seems like you keep adding little touches and details. 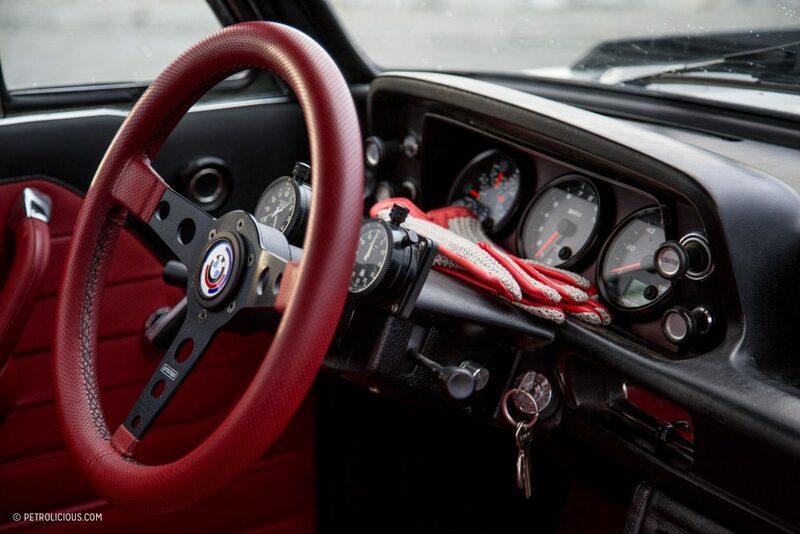 Do you enjoy driving it was much as the ongoing process of making it your own? AJ: Yes, I love this car so much! I now use it for weekend drives in the hills of northern California mostly, and doing occasion vintage road rallies whenever I can. You may not believe me, but I love driving it so much that I sold my 2015 Porsche GT3 because the 2002 is more fun! PS: Well it is clear you love your car Ali, and for good reason. Thank you for sharing it with us! 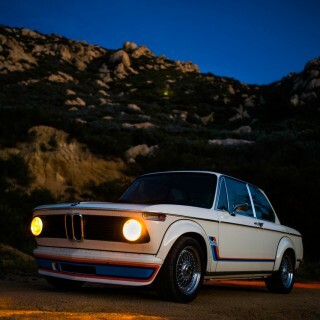 This car is beautiful. Its amazing how it has its own character. Well done ! 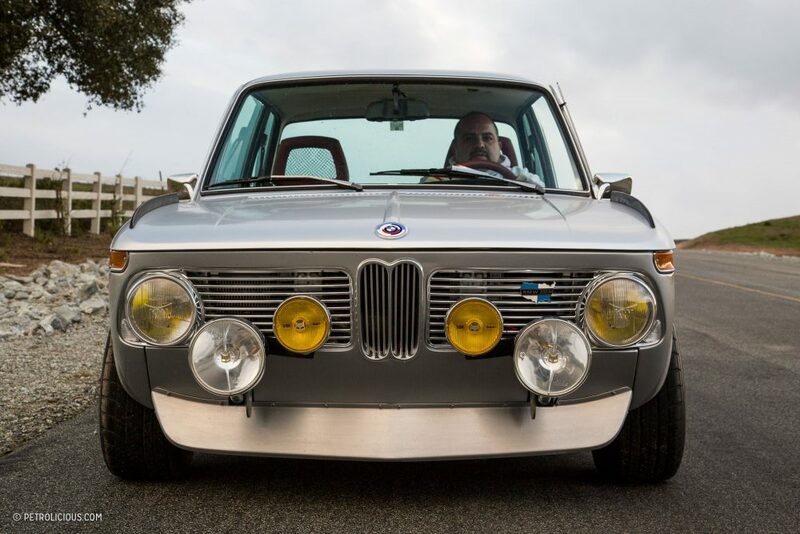 Come and see Ali’s 2002 at the ICON: 50 Years of 2002 exhibition at the BMW CCA Foundation museum in Greer SC. The exhibition opens on May 17 and will run through the end of the year. Every month it feels like I want a 2002 just a little bit more. Feels like the perfect platform for a nifty little modded number. Awesome car, especially the interior. I’d love to ride shotgun on one of those drives in the hills!